Hiring? Toptal handpicks top chatbot developers to suit your needs. Randall has over 8+ of development experience working across various domains and languages and is known for his attention to detail. Discord is a real-time messaging platform that bills itself as an “all-in-one voice and text chat for gamers.” Due to its slick interface, ease of use, and extensive features, Discord has experienced rapid growth and is becoming increasingly popular even among those with little interest in video games. Between May 2017 and May 2018, its user base exploded from 45 million users to more than 130 million, with more than twice as many daily users as Slack. One of the most attractive features of Discord from a chatbot developer’s perspective is its robust support for programmable bots that help to integrate Discord with the outside world and provide users with a more engaging experience. 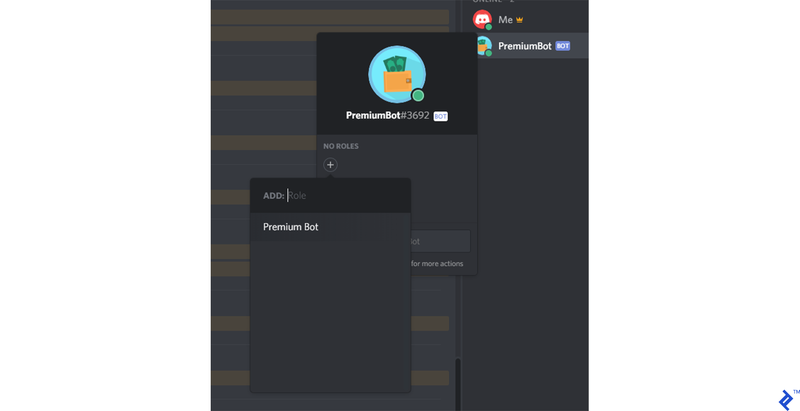 Bots are ubiquitous on Discord and provide a wide range of services, including moderation assistance, games, music, internet searches, payment processing, and more. Before we discuss technical details, it’s important to understand how a user interacts with Discord and how Discord presents itself to users. The way it presents itself to bots is conceptually similar (but of course non-visual). In fact, the official Discord applications are built on the same APIs that bots use. 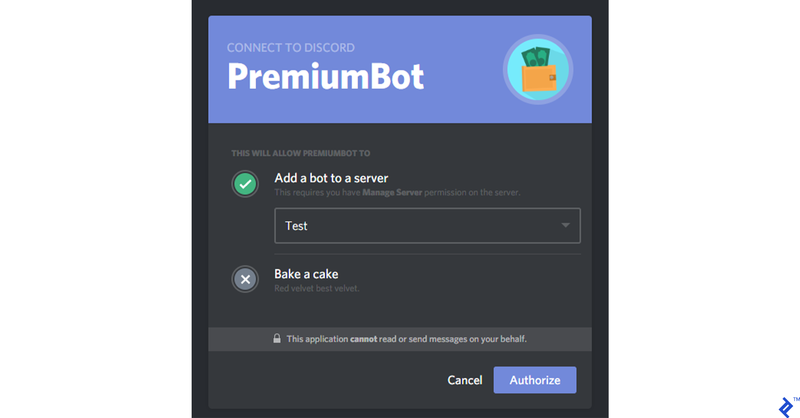 It is technically possible to run a bot inside of a regular user account with little modification, but this is forbidden by Discord’s terms of service. Bots are required to run in bot accounts. Here’s a look at the browser version1 of the Discord application running inside of Chrome. 1The Discord UI for the desktop application is virtually the same as the web application, packaged with Electron. The iOS application is built with React Native. The Android application is native Android Java code. All the way on the left is the list of servers that I am a member of. If you’re familiar with Slack, a server is analogous to a Slack workspace, and represents a group of users who can interact with each other within one or more channels in the server. A server is managed by its creator and/or whatever staff they select and choose to delegate responsibilities to. The creator and/or staff define the rules, the structure of the channels in the server, and manage users. In my case, the Discord API server is at the top of my server list. It’s a great place to get help and talk with other developers. Below that is a server that I created called Test. We’ll be testing the bot we create later there. Below that is a button to create a new server. Anyone can create a server with a few clicks. Note that while the term used in Discord’s user interface is Server, the term used in the developer documentation and API is Guild. Once we move on to talking about technical topics, we will switch to talking about Guilds. The two terms are interchangeable. Just to the right of the server list is the list of channels for the server I am currently viewing (in this case, the Discord API server). Channels can be broken up into an arbitrary number of categories. In the Discord API server, the categories include INFORMATION, GENERAL, and LIBS, as shown. Each channel functions as a chat room where users can discuss whatever topic the channel is dedicated to. The channel we are currently viewing (info) has a lighter background. Channels that have new messages since we last viewed them have a white text color. This is the channel view where we can see what users have been talking about in the channel we are currently viewing. We can see one message here, only partially visible. It’s a list of links to support servers for individual Discord bot libraries. The server administrators have configured this channel so that regular users like myself cannot send messages in it. The administrators use this channel as a bulletin board to post some important information where it can easily be seen and won’t be drowned out by chat. All the way on the right is a list of the users currently online in this server. The users are organized into different categories and their names have different colors. This is a result of the roles that they have. 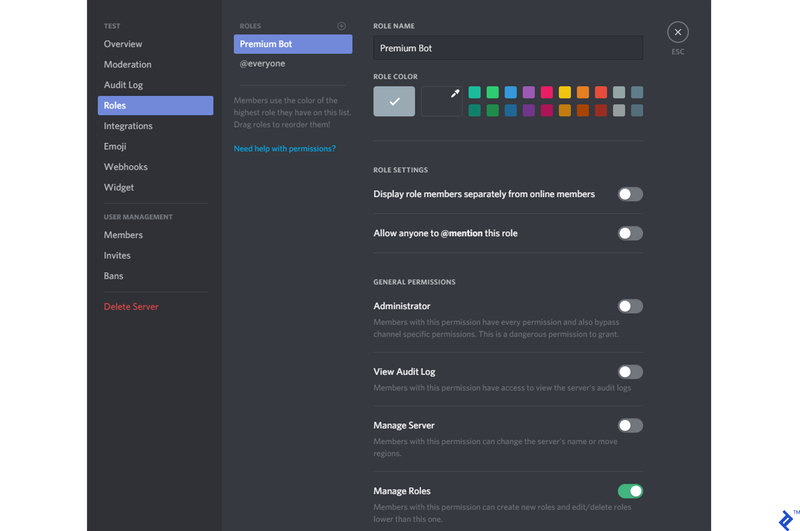 A role describes what category (if any) the user should appear under, what their name color should be, and what permissions they have in the server. A user can have more than one role (and very often does), and there is some precedence math that determines what happens in that case. At a minimum, every user has the @everyone role. Other roles are created and assigned by server staff. This is the text input where I could type and send messages, if I were allowed to. Since I don’t have permission to send messages in this channel, I can’t type in here. This is the current user. I set my username to “Me,” to help keep me from getting confused, and because I’m terrible at choosing names. Below my username is a number (#9484) which is my discriminator. There may be many other users named “Me,” but I’m the only “Me#9484.” It is also possible for me to set a nickname for myself on a per-server basis, so I can be known by different names in different servers. The Discord API consists of two separate pieces: the WebSocket and REST APIs. Broadly speaking, the WebSocket API is used to receive events from Discord in real time, while the REST API is used to perform actions inside of Discord. The WebSocket API is used to receive events from Discord, including message creation, message deletion, user kick/ban events, user permission updates, and many more. Communication from a bot to the WebSocket API on the other hand is more limited. A bot uses the WebSocket API to request a connection, identify itself, heartbeat, manage voice connections, and do a few more fundamental things. You can read more details at Discord’s gateway documentation (a single connection to the WebSocket API is referred to as a gateway). For performing other actions, the REST API is used. Events from the WebSocket API contain a payload including information that depends on the type of the event. For example, all Message Create events will be accompanied by a user object representing the author of the message. However, the user object alone does not contain all of the information there is to know about the user. For example, there is no information included about the user’s permissions. If you require more information, you could query the REST API for it, but for reasons explained further in the next section, you should generally access the cache that you should have built from payloads received from previous events instead. There are a number of events that deliver payloads relevant to a user’s permissions, including but not limited to Guild Create, Guild Role Update, and Channel Update. A bot can be present in a maximum of 2,500 guilds per WebSocket connection. In order to allow a bot to be present in more guilds, the bot must implement sharding and open several separate WebSocket connections to Discord. If your bot runs inside of a single process on a single node, this is just added complexity for you that may seem unnecessary. But if your bot is very popular and needs to have its back-end distributed across separate nodes, Discord’s sharding support makes this much easier than it would be otherwise. The Discord REST API is used by bots to perform most actions, such as sending messages, kicking/banning users, and updating user permissions (broadly analogous to the events received from the WebSocket API). The REST API can also be used to query for information; however, bots mainly rely on events from the WebSocket API instead and cache the information received from the WebSocket events. There are several reasons for this. 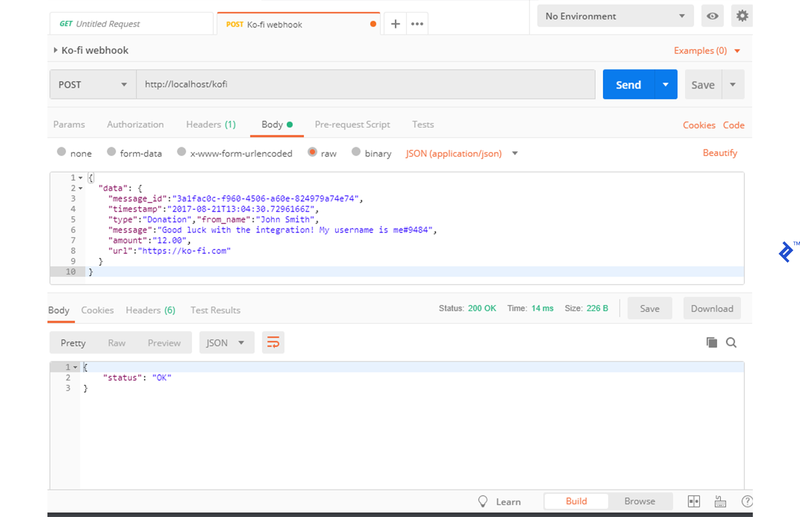 Querying the REST API to get user information every time a Message Create event is received, for example, does not scale due to the REST API’s rate limits. It’s also redundant in most cases, as the WebSocket API delivers the necessary information and you should have it in your cache. There are some exceptions, however, and you may sometimes need information that is not present in your cache. When a bot initially connects to a WebSocket gateway, a Ready event and one Guild Create event per guild that the bot is present in on that shard are initially sent to the bot so that it can populate its cache with the current state. The Guild Create events for heavily populated guilds only include information about online users. If your bot needs to get information about an offline user, the relevant information may not be present in your cache. In this case, it makes sense to make a request to the REST API. Or, if you find yourself frequently needing to get information about offline users, you can instead opt to send a Request Guild Members opcode to the WebSocket API to request offline guild members. Another exception is if your application isn’t connected to the WebSocket API at all. For example if your bot has a web dashboard that users can log into and change the bot’s settings in their server. The web dashboard could be running in a separate process without any connections to the WebSocket API and no cache of data from Discord. It may only need to occasionally make a few REST API requests. In this kind of scenario, it makes sense to rely on the REST API to get the information you need. While it’s always a good idea to have some understanding of every level of your technology stack, using the Discord WebSocket and REST APIs directly is time-consuming, error-prone, generally unnecessary, and in fact dangerous. Using custom implementations or non-compliant libraries which abuse the API or cause excessive rate limits may result in a permanent ban. The libraries officially vetted by Discord are generally mature, well-documented, and feature full coverage of the Discord API. Most bot developers will never have a good reason to develop a custom implementation, except out of curiosity, or bravery! Let’s get down to business. We’re going to create a Discord bot that hangs out in our server and listens for webhooks from Ko-fi. Ko-fi is a service that allows you to easily accept donations to your PayPal account. It’s very simple to set up webhooks there, as opposed to PayPal where you need to have a business account, so it’s great for demonstration purposes or small-scale donation processing. As an aside, Patreon, another donation processor, provides an official Discord bot and supports configuring Discord roles as contributor benefits. We’re going to implement something similar, but of course more basic. The code for every step of the tutorial is available on GitHub (https://github.com/mistval/premium_bot). Some of the steps shown in this post omit unchanged code for brevity, so follow the provided links to GitHub if you think you might be missing something. Before we can start writing code, we need a bot account. Before we can create a bot account, we need a user account. To create a user account, follow the instructions here. 1) Create an application in the developer portal. 2) Fill in some basic details about the application (note the CLIENT ID shown here—we’ll need it later). 3) Add a bot user connected to the application. 4) Turn off the PUBLIC BOT switch and note the bot token shown (we’ll need this later as well). If you ever leak your bot token, for example by publishing it in an image in a Toptal Blog post, it is imperative that you regenerate it immediately. Anyone in possession of your bot token can control your bot’s account and cause potentially serious and permanent trouble for you and your users. 5) Add the bot to your test guild. To add a bot to a guild, substitute its client ID (shown earlier) into the following URI and navigate to it in a browser. After clicking authorize, the bot is now in my test guild and I can see it in the users list. It’s offline, but we’ll fix that soon. Assuming you have Node.js installed, create a project and install Eris (the bot library we’ll use), Express (a web application framework we’ll use to create a webhook listener), and body-parser (for parsing webhook bodies). Let’s start with baby-steps. First we will just get the bot online and responding to us. We can do this in 10-20 lines of code. Inside of a new bot.js file, we need to create an Eris Client instance, pass it our bot token (acquired when we created a bot application above), subscribe to some events on the Client instance, and tell it to connect to Discord. For demonstration purposes, we’ll hardcode our bot token into the bot.js file, but creating a separate config file and exempting it from source control is good practice. // Create a Client instance with our bot token. // When the bot is connected and ready, log to console. // this event will fire and we will check if the bot was mentioned. // If it was, the bot will attempt to respond with "Present". // There are various reasons why sending a message may fail. 2Mentioning is a way to get another user’s attention even if they aren’t present. A regular user, when mentioned, will be notified by desktop notification, mobile push notification, and/or a little red icon appearing over Discord’s icon in the system tray. The manner(s) in which a user is notified depends on their settings and their online state. Bots, on the other hand, do not get any kind of special notification when they are mentioned. They receive a regular Message Create event like they do for any other message, and they can check the mentions attached to the event to determine if they were mentioned. Now that we know we can get a bot online, let’s get rid of our current Message Create event handler and create a new one that lets us inform the bot that we’ve received payment from a user. For example, pb!addpayment @Me 10.00 to record a payment of $10.00 made by Me. The pb! part is referred to as a command prefix. It is a good convention to choose a prefix that all commands to your bot must begin with. This creates a measure of namespacing for bots and helps avoid collision with other bots. Most bots include a help command, but imagine the mess if you had ten bots in your guild and they all responded to help! Using pb! as a prefix is not a foolproof solution, as there may be other bots that also use the same prefix. Most popular bots allow their prefix to be configured on a per-guild basis to help prevent collision. Another option is to use the bot’s own mention as its prefix, although this makes issuing commands more verbose. // 1. No mention or invalid mention. // 2. No amount or invalid amount. // Ignore any messages sent as direct messages. // Ignore any message that doesn't start with the correct prefix. // Get the appropriate handler for the command, if there is one. // Separate the command arguments from the command prefix and command name. Not only did we get the bot to respond to the pb!addpayment command, but we created a generalized pattern for handling commands. We can add more commands just by adding more handlers to the commandHandlerForCommandName dictionary. We have the makings of a simple command framework here. Handling commands is such a fundamental part of making a bot that many people have written and open-sourced command frameworks that you could use instead of writing your own. Command frameworks often allow you to specify cooldowns, required user permissions, command aliases, command descriptions and usage examples (for an automatically generated help command), and more. Eris comes with a built-in command framework. // Get the requested command, if there is one. // to execute it for any other user. // Separate the command arguments from the command prefix and name. Now the bot will angrily refuse to execute the addpayment command if anyone other than the bot owner tries to execute it. hoist: true, // Show users with this role in their own section of the member list. // If the user donated more than $10, give them the premium role. // Get the role, or if it doesn't exist, create it. // for the guild log (the "audit log"). Now I can try saying pb!addpayment @Me 10.00 and the bot should assign me the Premium Member role. Oops, a Missing Permissions error appears in the console. We can give the bot the Manage Roles permission by creating a role in the server settings, enabling the Manage Roles permission for that role and assigning the role to the bot. Now, when I try to execute the command again, the role is created and assigned to me and I have a fancy name color and a special position in the member list. In the command handler, we have a TODO comment suggesting that we need to check for invalid arguments. Let’s take care of that now. This should give you a good basic idea of how to create a Discord bot. Now we are going to see how to integrate the bot with Ko-fi. If you’d like, you can create a webhook in your dashboard at Ko-fi, make sure your router is configured to forward port 80, and send real live test webhooks to yourself. But I’m just going to use Postman to simulate requests. Let’s create a new source file called webhook_listener.js and use Express to listen for webhooks. We’ll only have one Express route, and this is for demonstration purposes, so we won’t worry too much about using an idiomatic directory structure. We’ll just put all of the web server logic in one file. Then let’s require the new file at the top of bot.js so that the listener starts when we run bot.js. After starting the bot, you should see “Hello” when you navigate to http://localhost/kofi in your browser. Now let’s have the WebhookListener process the data from the webhook and emit an event. And now that we’ve tested that our browser can access the route, let’s change the route to a POST route, as the webhook from Ko-fi will be a POST request. // about the response body, it just wants a 200. Next we need to have the bot listen for the event, decide which user donated, and assign them a role. To decide which user donated, we’ll try to find a user whose username is a substring of the message received from Ko-fi. Donors must be instructed to provide their username (with the discriminator) in the message than they write when they make their donation. // Look for a matching username in the form of username#discriminator. In the onDonation function, we see two representations of a user: as a User, and as a Member. These both represent the same person, but the Member object contains guild-specific information about the User, such as their roles in the guild and their nickname. Since we want to add a role, we need to use the Member representation of the user. Each User in Discord has one Member representation for each guild that they are in. Now I can use Postman to test the code. I receive a 200 status code, and I get the role granted to me in the server. If the message from Ko-fi does not contain a valid username; however, nothing happens. The donor doesn’t get a role, and we are not aware that we received an orphaned donation. Let’s add a log for logging donations, including donations that can’t be attributed to a guild member. The log channel ID should be added to the constants section of bot.js. And then we can write a logDonation function. Now I can invoke the webhook again, first with a valid username, and then without one, and I get two nice log messages in the log channel. Now we are being notified of donations, logging them, and rewarding our supporters. We can also add donations manually with the addpayment command in case a user forgets to specify their username when they donate. Let’s call it a day. If a user leaves our guild (or if they weren’t even in our guild in the first place), they will lose their Premium Member role, and if they rejoin, they won’t get it back. We should store payments by user ID in a database, so if a premium member rejoins, we can give them their role back and maybe send them a nice welcome-back message if we were so inclined. Paying in installments won’t work. If a user sends $5 and then later sends another $5, they won’t get a premium role. Similar to the above issue, storing payments in a database and issuing the Premium Member role when the total payments from a user reaches $10 would help here. It’s possible to receive the same webhook more than once, and this bot will record the payment multiple times. If Ko-fi doesn’t receive or doesn’t properly acknowledge a code 200 response from the webhook listener, it will try to send the webhook again later. Keeping track of payments in a database and ignoring webhooks with the same ID as previously received ones would help here. Our webhook listener isn’t very secure. Anyone could forge a webhook and get a Premium Member role for free. Ko-fi doesn’t seem to sign webhooks, so you’ll have to rely on either no one knowing your webhook address (bad), or IP whitelisting (a bit better). The bot is designed to be used in one guild only. There are over a dozen websites for listing Discord bots and making them available to the public at large, including DiscordBots.org and Discord.Bots.gg. Although Discord bots are mostly the foray of small-time hobbyists, some bots experience tremendous popularity and maintaining them evolves into a complex and demanding job. By guild-count, Rythm is currently the most widespread bot on Discord. Rythm is a music bot whose specialty is connecting to voice channels in Discord and playing music requested by users. Rythm is currently present in over 2,850,000 guilds containing a sum population of around 90 million users, and at its peak plays audio for around 100,000 simultaneous users in 20,000 separate guilds. Rythm’s creator and main developer, ImBursting, kindly agreed to answer a few questions about what it’s like to develop and maintain a large-scale bot like Rythm. Interviewer: Can you tell us a bit about Rythm’s high level architecture and how it’s hosted? ImBursting: Rythm is scaled across 9 physical servers, each have 32 cores, 96GB of RAM and a 10gbps connection. These servers are collocated at a data center with help from a small hosting company, GalaxyGate. I imagine that when you started working on Rythm, you didn’t design it to scale anywhere near as much as it has. Can you tell us about about how Rythm started, and its technical evolution over time? Rythm’s first evolution was written in Python, which isn’t a very performant language, so around the time we hit 10,000 servers (after many scaling attempts) I realised this was the biggest roadblock and so I began recoding the bot to Java, the reason being Java’s audio libraries were a lot more optimised and it was generally a better suited language for such a huge application. After re-coding, performance improved tenfold and kept the issues at bay for a while. And then we hit the 300,000 servers milestone when issues started surfacing again, at which point I realised that more scaling was required since one JVM just wasn’t able to handle all that. So we slowly started implementing improvements and major changes like tuning the garbage collector and splitting voice connections onto separate microservices using an open source server called Lavalink. This improved performance quite a bit but the final round of infrastructure was when we split this into 9 seperate clusters to run on 9 physical servers, and made custom gateway and stats microservices to make sure everything ran smoothly like it would on one machine. I noticed that Rythm has a canary version and you get some help from other developers and staff. I imagine you and your team must put a lot of effort into making sure things are done right. Can you tell us about what processes are involved in updating Rythm? Rythm canary is the alpha bot we use to test freshly made features and performance improvements before usually deploying them to Rythm 2 to test on a wider scale and then production Rythm. The biggest issue we encounter is really long reboot times due to Discord rate limits, and is the reason I try my best to make sure an update is ready before deciding to push it. I do get a lot of help from volunteer developers and people who genuinely want to help the community, I want to make sure everything is done correctly and that people will always get their questions answered and get the best support possible which means im constantly on the lookout for new opportunities. Discord’s days of being a new kid on the block are past, and it is now one of the largest real-time communication platforms in the world. While Discord bots are largely the foray of small-time hobbyists, we may well see commercial opportunities increase as the population of the service continues to increase. Some companies, like the aforementioned Patreon, have already waded in. 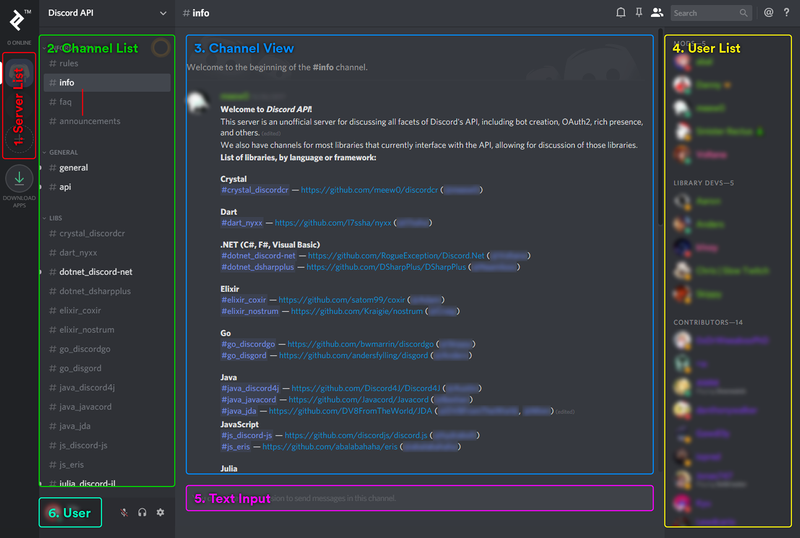 In this article, we saw a high-level overview of Discord’s user interface, a high-level overview of its APIs, a complete lesson in Discord bot programming, and we got to hear about what it’s like to operate a bot at enterprise scale. I hope you come away interested in the technology and feeling like you understand the fundamentals of how it works. Chatbots are generally fun, except when their responses to your intricate queries have the intellectual the depth of a cup of water. To ensure a great UX for your users see The Chat Crash - When a Chatbot Fails by the Toptal Design Blog for 5 design problems to avoid. What is a Discord bot? A Discord bot is an automated chatbot that operates on Discord, a popular text and voice communication platform. Bots are ubiquitous on Discord and can be programmed to provide many different services. What are Discord bots used for? Some common roles that bots fulfill include moderation, playing games with users, playing music in voice channels, internet searching, and payment processing. Bots fill countless other common and niche roles as well. What exactly does a Discord bot library do? A bot library takes care of the details of interacting with Discord’s WebSocket and REST APIs so that you can code at a higher level of abstraction. Many libraries also include higher-level features such as command frameworks. What should I do if I leak my bot token? A+ if you said “immediately regenerate it in the Discord Developer Portal.” Token leaks are a frequent occurrence especially among novice developers, and the consequences can be severe. Web crawlers watch GitHub for leaked bot tokens, and compromised bots are used for nefarious purposes. How do you create a Discord bot? 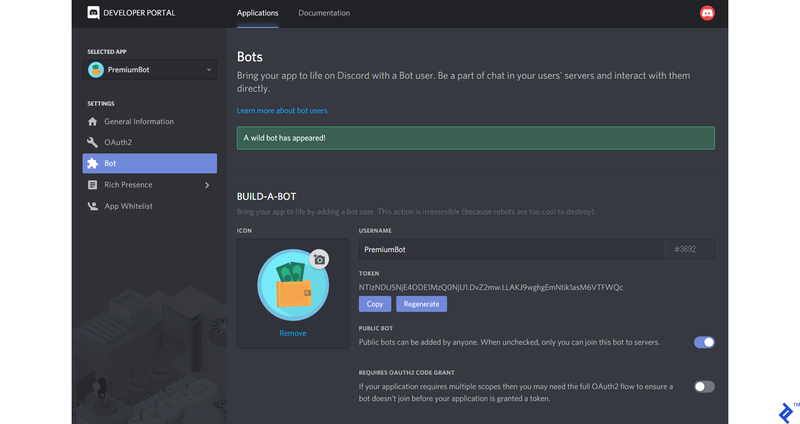 Anyone with a Discord account can access Discord’s Developer Portal (https://discordapp.com/developers/applications/), register an application, create a bot user, and acquire a bot token. From there, you can use a Discord library of your choice to program your bot.